The readily available global rock phosphate (P) reserves may be depleted within the next 50–130 years warranting careful use of this finite resource. We develop a model that allows us to assess a range of P fertiliser and soil management strategies for Barley in order to find which one maximises plant P uptake under certain climate conditions. Our model describes the development of the P and water profiles within the soil. Current cultivation techniques such as ploughing and reduced till gradient are simulated along with fertiliser options to feed the top soil or the soil right below the seed. Our model was able to fit data from two barley field trials, achieving a good fit at early growth stages but a poor fit at late growth stages, where the model underestimated plant P uptake. A well-mixed soil (inverted and 25 cm ploughing) is important for optimal plant P uptake and provides the best environment for the root system. 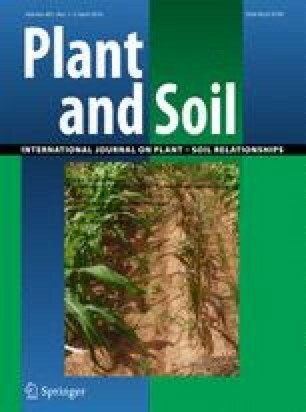 The model is sensitive to the initial state of P and its distribution within the soil profile; experimental parameters which are sparsely measured. The combination of modelling and experimental data provides useful agricultural predictions for site specific locations. Responsible Editor: Tim S. George. We would like to thank the BBSRC and DEFRA (BB/I024283/1) for funding S.P. and The Royal Society University Research Fellowship for funding T.R. K.C.Z. was partially funded by Award No. KUK-C1-013-04 of the King Abdullah University of Science and Technology (KAUST); J.F. by EPSRC and CORMSIS; J.H. by EPSRC Complexity DTC; and S.P., P.T., D.L., R.S-B., R.W., D.L.J. and T.R. by DEFRA, BBSRC, Scottish Government, AHDB, and other industry partners through Sustainable Arable LINK Project LK09136.